Photos :Check Out The Luxurious Limouzine That Moves Both On Land And Sea. What makes this vehicle awesome is the fact that it can move on both water and land. It’s a limousine when it moves on land and a Yacht on water. 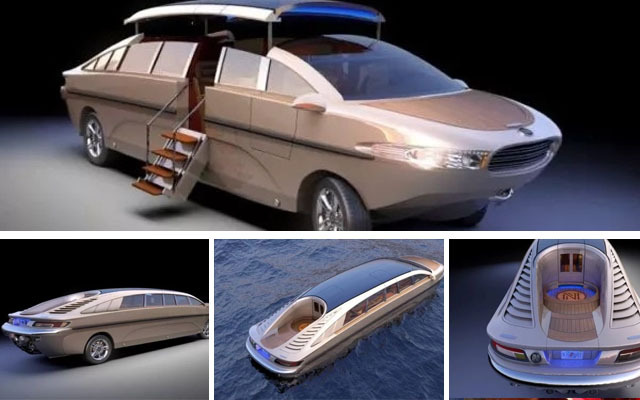 It is called Tender 33, the amphibious limousine by Nouvoyage and it costs approximately ₦720 million ($2 million). The limousine is a spectacular 33 foot-long vehicle with the capacity to carry 12 passengers, 2 crew members and wheelchair access. The Nouvoyage Tender 33 limousine can reach a top speed of 84 mph on land and 28 knots on water. It also has a controlled temperature cabin and toilet on board, this stunning limousine becomes the perfect vessel for those who wish to travel in style while their yacht is anchored at sea, away from the dock. The limousine is one of the most exclusive amphibious vehicles in today´s market. Gossip Mail: Photos :Check Out The Luxurious Limouzine That Moves Both On Land And Sea.